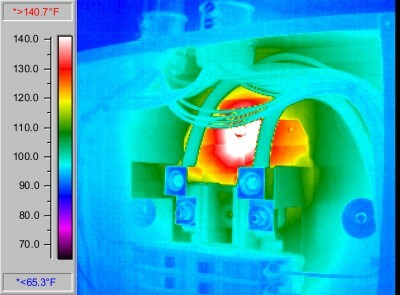 Infrared Thermography is an ideal inspection technique for scanning electrical equipment for defective components. Normal wear, chemical contamination, corrosion, fatigue and faulty installation may lower the conductivity and raise the component resistance level. This in turn will cause an increase in temperature of the component. Routine infrared scanning of electrical components is a valuable predictive maintenance tool whereby early corrective action may be taken to prevent costly breakdowns and/or building hazards. The benefit of using infrared imaging for bearing analysis is that both excessive wear and improper lubrication can be identified. Identification of excessive bearing wear allows you to replace a bearing at your convenience prior to failure. The identification of improper lubrication is seldom held accountable, but is one of the most common causes of premature bearing failure. Minimizing improper lubrication will prevent us from replacing many bearing's altogether. The thermal signature allows us to distinguish between bearing wear and improper lubrication. The infrared roof moisture survey is based on thermal differences which exist at certain times between dry roof insulation and insulation which has been infiltrated by water. On a sunny day, the roof system conducts heat which is absorbed by wet insulation and resisted by dry insulation. At night, the dry insulated areas will cool quickly while the wet areas will retain their absorbed heat much longer. These thermal differences are detectable by the high resolution thermal cameras that are operated by our experienced and certified thermographers. Increasing fuel costs make it more important than ever to identify energy loss resulting from insufficient or inadequately installed insulation in residential and commercial buildings. The increased energy consumption that results from summer heat gains and winter heat losses can justify a infrared energy loss survey. Heating and cooling costs can be reduced by pinpointing the source of the energy loss by insuring that the building envelope is adequately insulated and all air leaks are sealed. There are many potentially serious problems with equipment and facilities which give early warnings of their existence in the form of thermal differences or possibly "Hot Spots". Unfortunately, these thermal early warning signs often go undetected until it's too late, with the result of unnecessary expenses and hazardous conditions. There are many times when our technicians find issues with items that are not normal. These issues can be major concerns for your company and they will be reported as well.